This event is sponsored by the Planetary Health Alliance, Harvard Center for Population and Development Studies, Harvard T.H. Chan School of Public Health, Harvard University Center for the Environment, and the Center for Climate, Health and the Global Environment (C-CHANGE) at the Harvard T.H. Chan School of Public Health. Climate change threatens humanity and the planet on which we live. Social inequities, including startling variance in the health outcomes that different population groups enjoy, also pose a threat to humanity, although less directly. Together, the scale of devastation these threats pose is unprecedented…but wholesale destruction is not inevitable. Humanity can and must act to prevent catastrophic climate change and redress egregious global health inequities. It must act now. This talk, and the associated book [Climate Change and the People’s Health, OUP 2018], outlines some of the steps necessary to move from denial and inertia towards effective mobilization across multiple policy domains and institutions. Sharon Friel is Professor of Health Equity and Director of the School of Regulation and Global Governance (RegNet), Australian National University. She is also Director of the Menzies Centre for Health Policy ANU. She is a Fellow of the Academy of Social Sciences Australia. She is Co-Director of the NHMRC Centre for Research Excellence in the Social Determinants of Health Equity. Between 2005 and 2008 she was the Head of the Scientific Secretariat (University College London) of the World Health Organisation Commission on Social Determinants of Health. Her interests are in the political economy of health; policy, governance and regulation in relation to the social determinants of health inequities, including trade and investment, food systems, and climate change. 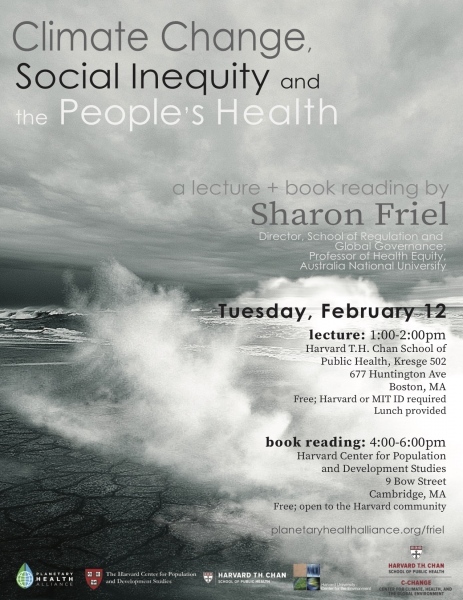 Sharon's book Climate Change and the People's Health will be available for purchase at the book reading.